Classics on Wheels® Classic Car Show Marbella is organised and hosted by the American Classic Car Owners Club Costa del Sol in Puerto Banus featuring live entertainment, BBQ and cold drinks as well as incredible classic cars from all over the world. The show celebrates all makes and models, veteran, the vintage and the classics, with a diverse display classic car and more ranging from the most accessible popular classics through to the thoroughly outrageous and rare exotica. 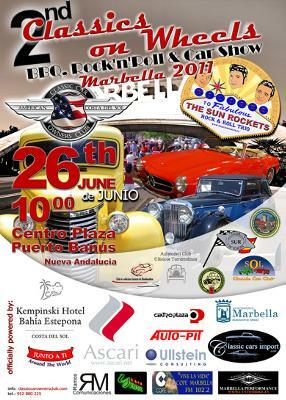 The event will take place on the car park of the Centro Plaza in Puerto Banus (Nueva Andalucía), next to the Bullring. Exhibition of classic and race cars from the prestigious Ascari Race Resort and Harley Davidson’s custom bikes from Marbella Performance. The program and event details are subject to changes! Subscription fee for classic cars & driver per bank transfer €25, every other person in the car is free. Subscription fee on the day of the event €35! Only Classic Cars 30 years old or more are allowed to participate. Deadline for register 20.06.11. For more information go to www.classiccarownersclub.com or call +34 952 880 225.